I hope 2019 finds you with happy hearts! This 2018 Occasions stamp set, Heart Happiness (now retired) made my heart smile. I liked it cause it has an array of nice and not-to-fancy hearts. Perfect for many occasions. I used it to make this month’s calendar along with blushing bride and berry burst inks and papers. 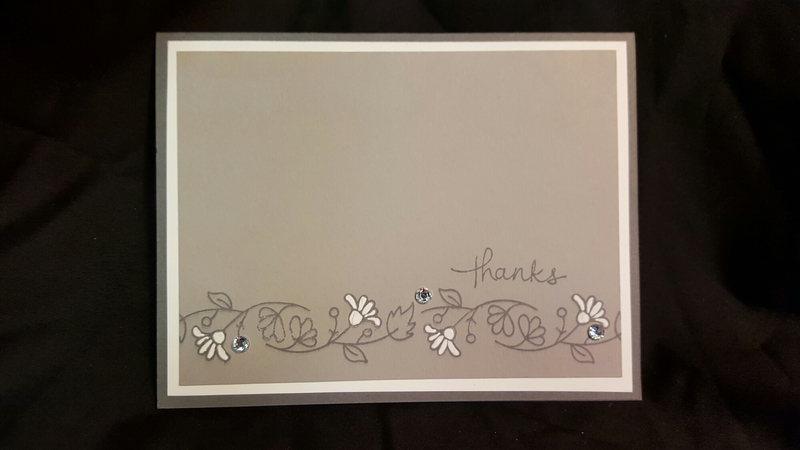 It’s such a simple layout and design and can easily be transcribed to a clean and simple card front… Perfect for that friend or significant other…for whomever’s heart you’d like to make happy! Oh! I had a fun little idea to share for you DIYers out there… This comes follower, Roberta. Instead of gifting the entire calendar at once, she sends her friends the next calendar page one month at a time with a little note! This most DEFINITELY makes my heart happy. Head over and check out what Anne and Cheryl have done! So! Happy September! I can’t believe this has come around so fast! This calendar page is one of my favorites. When the Holiday Catalog came out last fall, there was a stamp set called “Cheers to the Year” (now retired) that was meant for New Year’s. Images of sparklers and wreaths for the holidays… but, I LOVED the shapes. The two different (what were supposed to be wreaths) circles had fabulous ‘texture’ and I really enjoyed putting them together to make some fun geometric patterns. So, you can see here, the colors are light enough that they can be stamped over the text in the calendar and it still works. The colors I used were Bermuda Bay, Night of Navy, and Lemon Lime twist. The picture lighting isn’t the best but the cardstock is navy as well. Happy September to you! Head on over to see what Anne and Cheryl have for you! One of my favorite things to do in the summertime when we went to visit my Grandma’s was to run out and get a special treat when the icecream truck went by. So, when Stampin’ Up released the Tasty Truck Stamp Set (now retired), I just KNEW it had to be for my summertime calendar! This is such a fun little truck! I used the watercolor pencils to color in the details! I like the pencils because they are very pigmented and work well as a pencil or as a watercolor. It’s super easy to use! Hope you have a fun summer! Head over to see what Anne and Cheryl have for you! Happy March! Can’t believe it is nearly spring break. As a teacher, every month has it’s highlight and for March, it’s most definitely spring break. So. The name of this stamp set is Ready to Pop. And it has this awesome little border stamp that works so perfect here. And the little punch (sorry, it’s retired) adds just the right flowers for some sweet sprintime blooms. The paper is blushing bride and the ink is pear pizzazz. Thanks for stopping by today! Head on over to see what Anne and Cheryl have for you! February is always a fun month for me… a return to a normal routine after the holidays and the anticipation of the summer (as a school teacher, February always is an encouragement…that I may actually survive until the end of the school year). And, I’ve always enjoyed Valentines from a crafting standpoint. There’s no pressure around the holiday like Christmas brings, and it’s opportunity to do something cute, simple and fun! Such a super simple, easy image. And you can color, or no need… And, he’s just a little friendly smile to see as you change the months on the calendar. Hope you enjoy your February! Head on over to see what Anne and Cheryl have for you today! I feel as I am growing up in my cardmaking (I suppose, if you are counting by years in SU, I am now a teenager…oh my), I do notice my tastes changing. This probably has a lot to do with current trends in just about everything, but more and more I find myself reaching for neutrals and creating simplicity. This card is that. Neutral simplicity. I love this set called Bordering Blooms. It is a FABULOUS border set. And EASY. I used TWO stamps on this card. TWO. The thanks comes from Endless Thanks (also a set I love, and it’s companion, Endless Birthday Wishes). I digress. 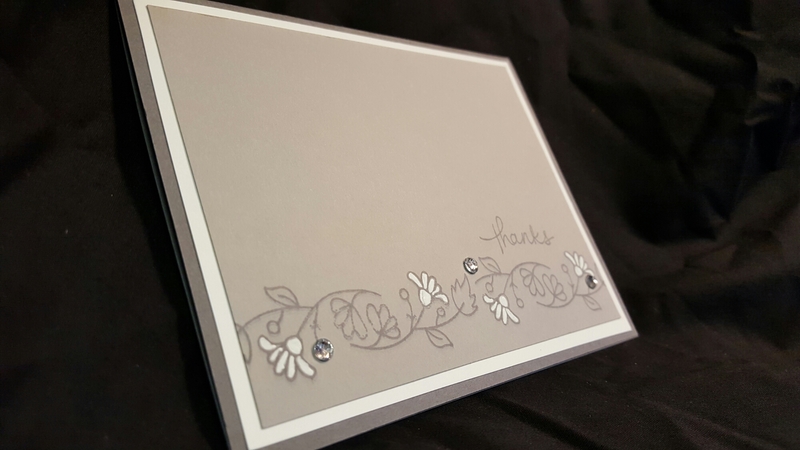 I used Tip Top Taupe and Sahara Sand and White (Sahara and Taupe are the monochromatic pairs… I just LOVE how SU gives us those options in their papers and inks). And, I colored in the selected flowers with the white gel pin. Added a some bling and THERE YOU GO. Instant Thank You. You can make a bazillion of these in no time. It’s good to make several at once… then you have a stockpile for when you need. OH… I didn’t get a pic of this… but that Bordering Blooms is also a GREAT stamp to put across the bottom of envelopes. To add pizzazz. Cause we all need pizzazz… even with Neutral Simplicity.